VERY WELL PRESENTED TWO BEDROOM TERRACE PROPERTY AVAILABLE NOW. The property is garden fronted and the front door leads into a vestibule and then into Reception One which has been used as both a lounge and a dining room. To the rear is the second reception room with gas fire in stone hearth and understair storage. Whilst many similar properties stop here, this property has an extensive breakfast kitchen comprising a range of wall and base units, electric double oven and grill, space power and plumbing for appliances and, as well as space for a table and chairs there is a breakfast bar. Outside the rear courtyard faces south and there is gated access for bins. To the first floor the larger of the two bedrooms is to the front with the second to the rear. The family bathroom is very spacious with vinyl flooring, wash hand basin, wc, bath with shower attachment and screen, tiled elevations and extractor fan. This property is decorated in neutral colours and is ready to move into. Double glazed with gas central heating, well proportioned rooms and close to village amenities. Do give us a call to arrange your viewing. 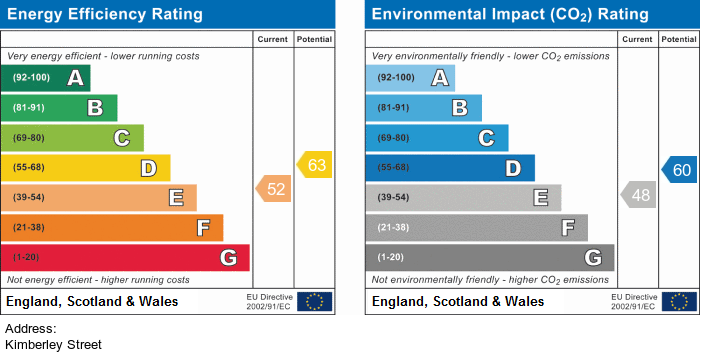 EPC E and Council Tax Band A. The property requires a deposit of £500 and a non-refundable referencing fee of £180.